Brunch has become my favorite meal. With so many options of sweet and savory breakfast and lunch foods, what’s not to like? A Mimosa or Bloody Mary doesn’t hurt either. 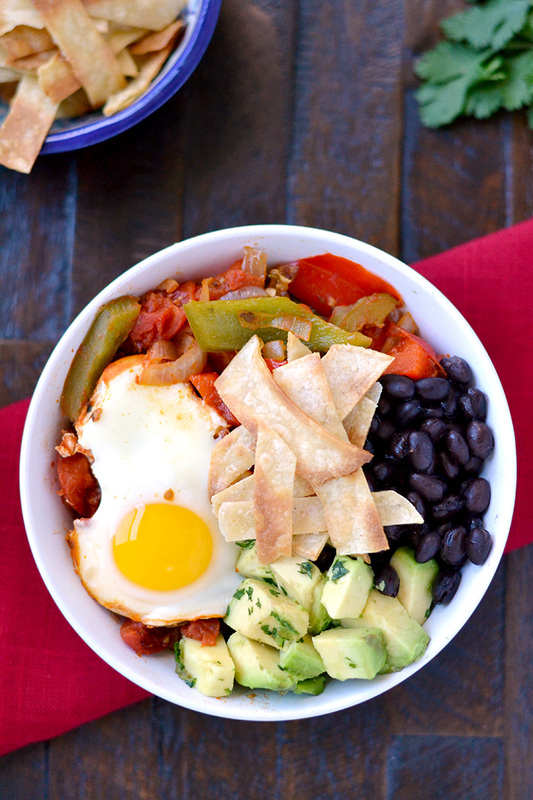 Huevos Rancheros seems to be popping up on brunch menus all over the country. These “rancher’s eggs,” as name translates to in English, are a twist on a rural Mexican farm dish that’s both hearty and delicious. 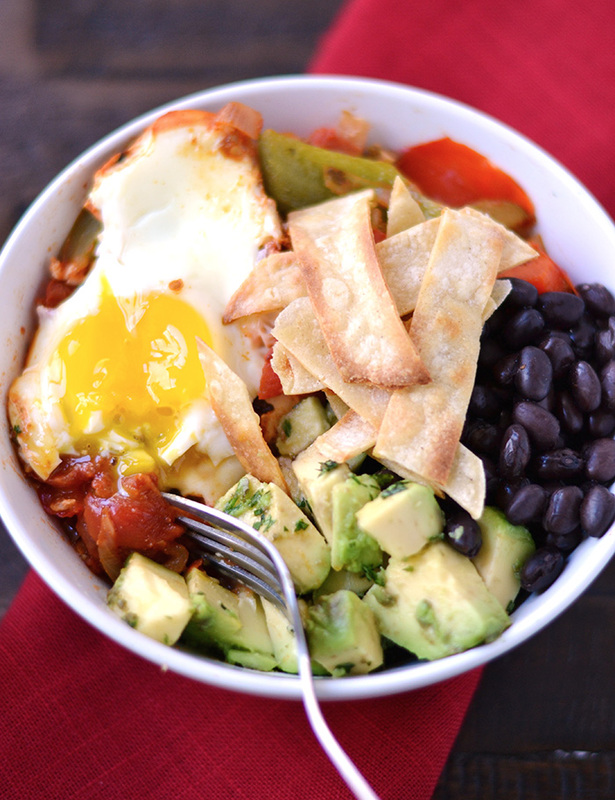 With so many variations of Huevos Rancheros, it’s hard to pick a favorite or know which one to try. At the basic level, Huevos Rancheros is simply fried eggs with a tomato chili sauce, usually served on lightly fried corn tortillas. Recently though, I’ve also seen casserole, burrito, and breakfast sandwich versions. This spicy, flavorful dish is so good that just about any variation is worthwhile. The Huevos Rancheros recipe I used for these easy mouth-watering bowls was adapted from Paula Peck’s cookbook, “The Art of Good Cooking.” I’ve made this basic recipe many different ways: as originally written, with scrambled eggs, with refried beans, and with rice. I never seem to get tired of it. Since my goal is to combine all of the flavors (spicy tomatoes and vegetables with beans, avocado, tortilla, and egg) in each bite, I decided a bowl was the best way to do this. The components are all close together, allowing the soft runny yoke to seep into the tasty crevices and corners. Preheat oven to 425 degrees. Cut tortillas in 1/4 inch to 1/2 inch strips. Place on a baking sheet and toss lightly with 2 tablespoons of olive oil to coat. Sprinkle with salt and pepper to taste. Spread evenly to make one layer. Bake 8-10 minutes. In a large heavy skillet, heat 3 tablespoons of olive oil over medium heat. Add chopped onion, peppers, jalapeno, and garlic. Cook until vegetables are barely tender. Stir in chili powder, cumin, and oregano. Simmer on low until tomatoes melt into a puree. Break eggs one at a time into sauce, making a depression for each egg so that eggs are partially covered in sauce. Cover pan and continue cooking until eggs are just set but still runny. Sprinkle with one tablespoon of cilantro (if using). Put 1/2 cup black beans in each bowl. Add rice, if using. Add vegetables from the pan and 1-2 eggs. Dice the avocado and sprinkle with remaining cilantro (if using). Add 1/4 of the avocado to each bowl. Sprinkle cheese on top (if using). Pile tortilla strips on the very top. Serve hot.